Home / Companies and Brands, Notes, The Cribb / Who is driving the digital marketing bus? 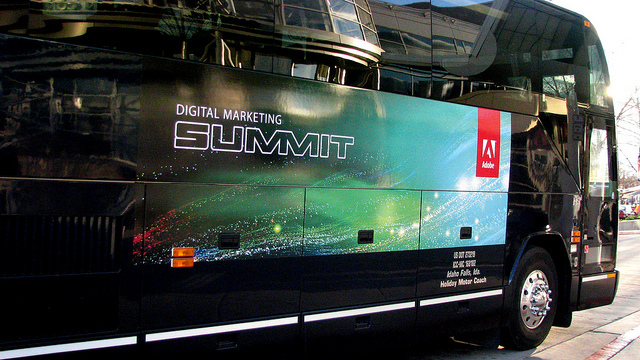 Who is driving the digital marketing bus? The chief marketing officer is now in control of IT marketing spend. A few years ago it might have been the CIO but no longer, to hear the industry tell it. “The era of the CMO is now here,” Larry Bowden, Vice President of Portals and Web Experience with IBM told me a few weeks ago. He or she is, it is now widely assumed, best able to determine what technology will once and for all identify what customers really truly want, what trends are lurking below the horizon that will impact the company and, for good measure, the meaning of life. The CMO is now at the wheel! Yet in a new IBM report there are disconcerting signs that marketing professionals are not feeling very confident in their ability to navigate this brave new world. The report, “Marketing science: From descriptive to prescriptive” found that out of a survey of 358 marketing professionals only 23 percent claim to be highly effective at uncovering new insights to generate additional business value. Only 25 percent claim to be highly effective at identifying and capturing new markets. And only 32 percent claim to be highly effective at engaging with individual customers. At the same time, the report also noted, most marketers are under intense pressure to show tangible returns on the money they spend. In fact, the report concluded, nearly two-thirds of CMOs expect return on marketing investment to be the primary measure of their effectiveness by 2015.